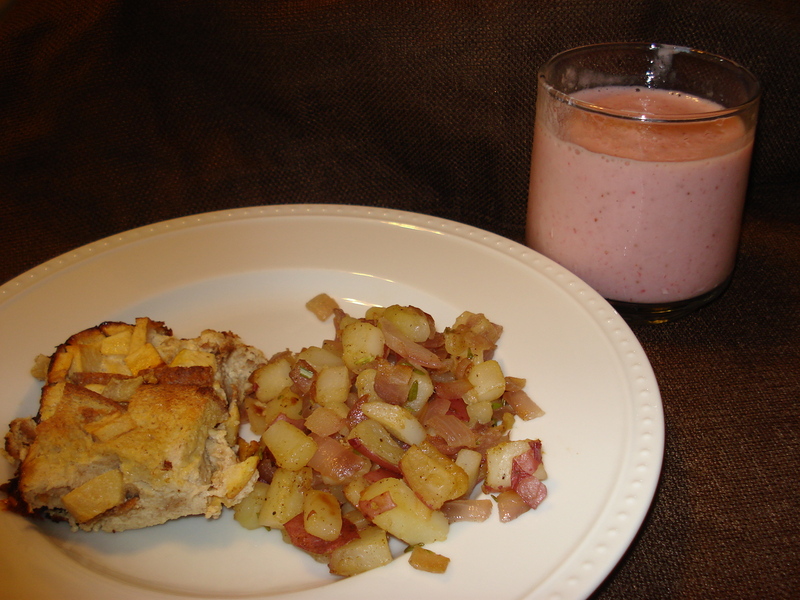 Perfect Sunday Brunch: French Toast Casserole, Potato Hash & Strawberry Smoothies! This weekend, I decided to surprise my husband by making brunch from scratch for him. I had never actually cooked brunch before in my life, so I was a little nervous about how it would turn out. But I found a couple great recipes from HungryGirl and EatingWell.com that looked really yummy, so I thought I’d give it a shot. I’m happy to report that the brunch was a total success!! All of the dishes turned out AMAZINGLY well – my husband LOVED them. And the french toast was a huge hit (thank you HungryGirl!) 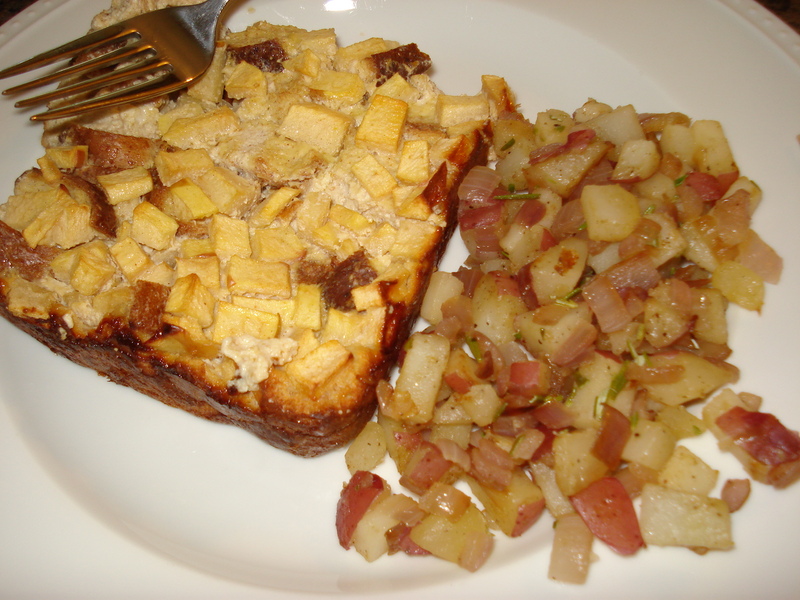 – my husband said he’s never liked french toast made at home, but he loved this dish. 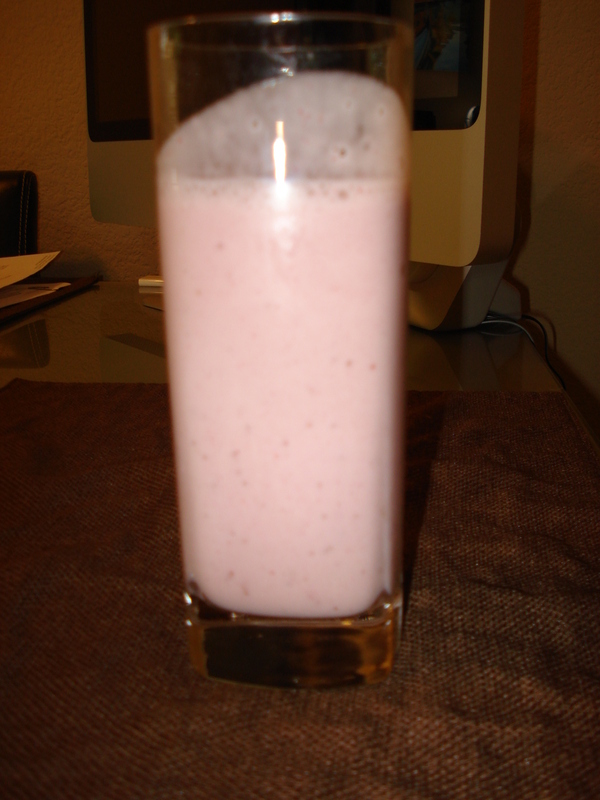 And the smoothies – which was a recipe that I made up – tasted exactly like the In-N-Out Strawberry Shakes, but my recipe was much healthier 🙂 All in all, it was a really fun cooking experience! The recipes (with my notes/modifications) and pictures are below, hope you enjoy them! 1 no-calorie sweetener packet (like Splenda), or more to taste. 1 packet made the french toast sweet enough for us. Spray an 8-inch by 8-inch baking dish with nonstick spray. 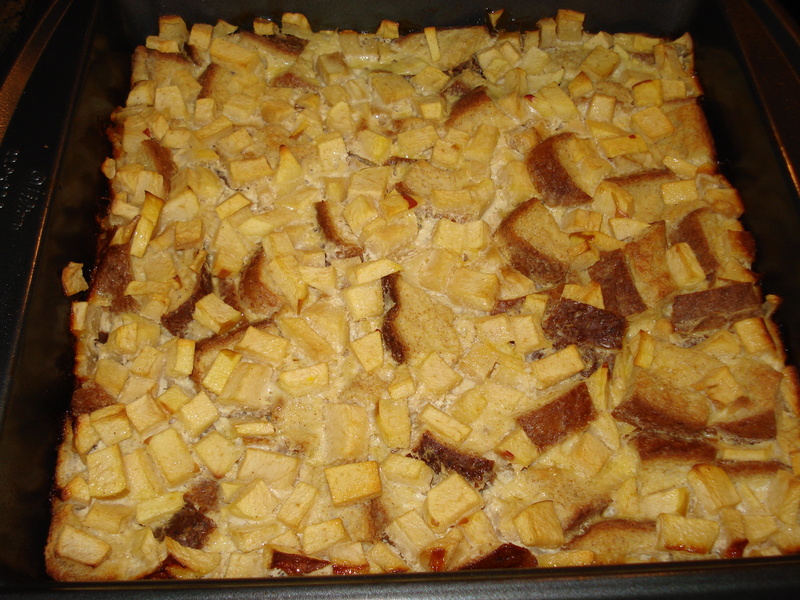 Place bread cubes evenly along the bottom of the dish. 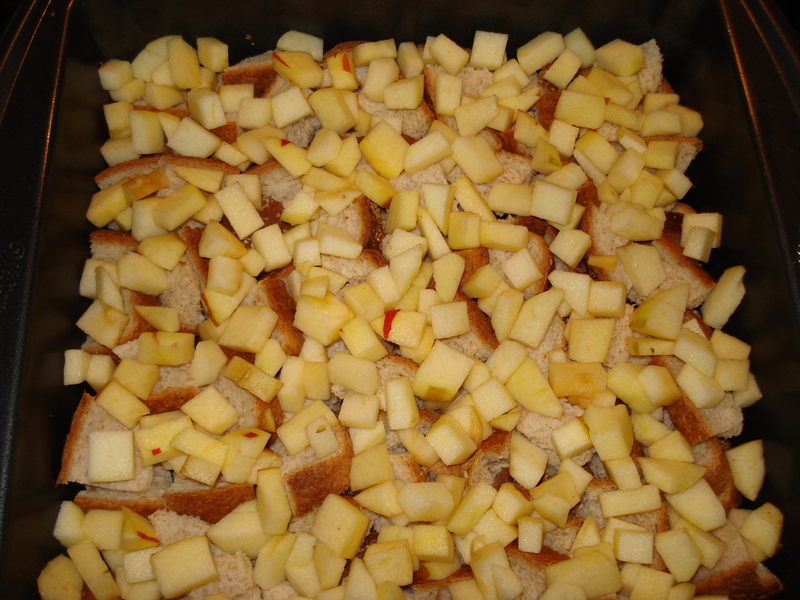 Sprinkle diced apple evenly over the bread. In a medium-large bowl, combine all other ingredients (cream cheese, soymilk, egg substitute, syrup, butter, cinnamon, and sweetener). If you like your French toast really sweet, add an extra packet of sweetener. Using a handheld electric mixer set to medium speed, mix until lump-free and smooth. Pour mixture over the bread and apple. Make sure bread is soaked in the liquid mixture. If needed, toss lightly to coat. Bake in the oven for about 45 minutes, until egg mixture is pretty firm and cooked through. Note – mine took about 50 min. (Be sure not to overcook, as bread may burn.) Let cool slightly and cut into quarters. If you like, serve with additional syrup for dipping. Dig in! Note: I modified most of this recipe, so my notes are below in purple text. This recipe was also a HUGE hit with my husband. He said he’d actually want this at a restaurant (and he always thinks hash browns at restaurants are the best)! Heat oil in a large nonstick skillet over medium heat. 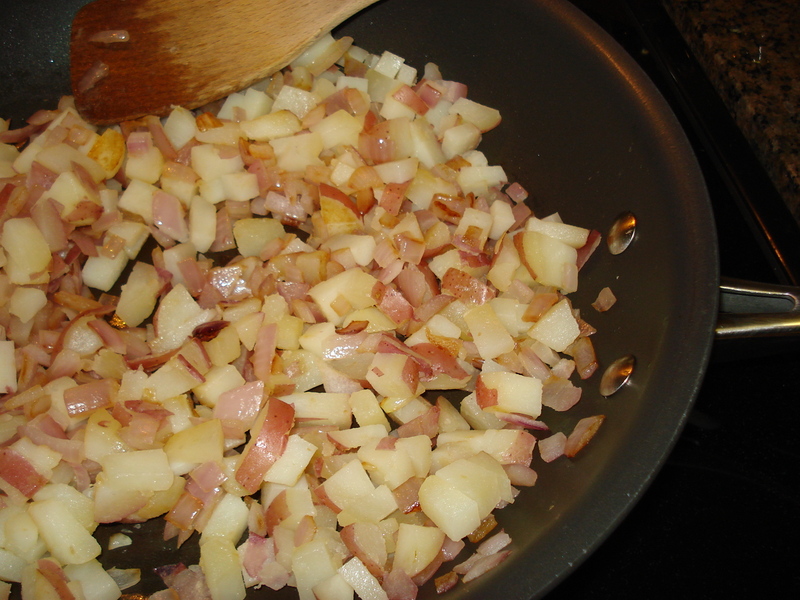 Add onion and sauté until they are limp and translucent, about 5 minutes. 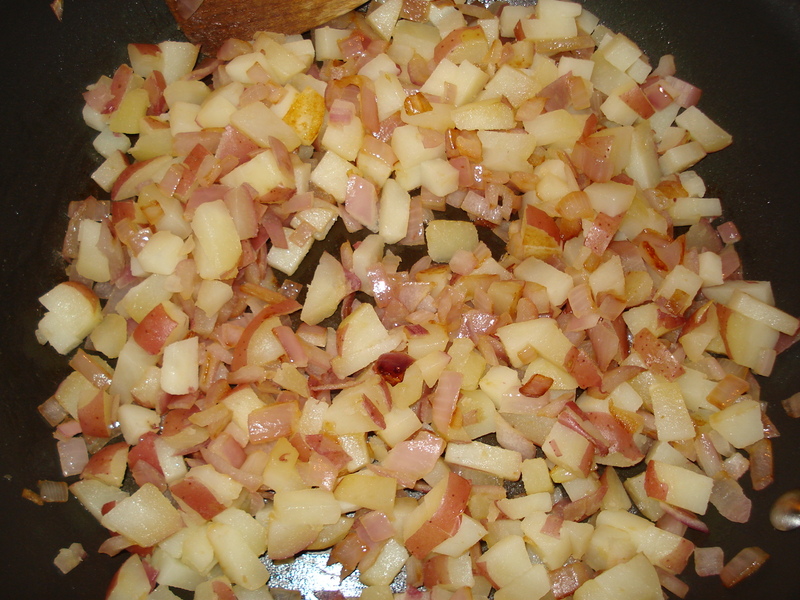 Add the potatoes and continue to sauté until golden brown, about 10 to 12 minutes. (Lower heat slightly if pan becomes too hot.) Season with salt, pepper and paprika (if you use paprika). 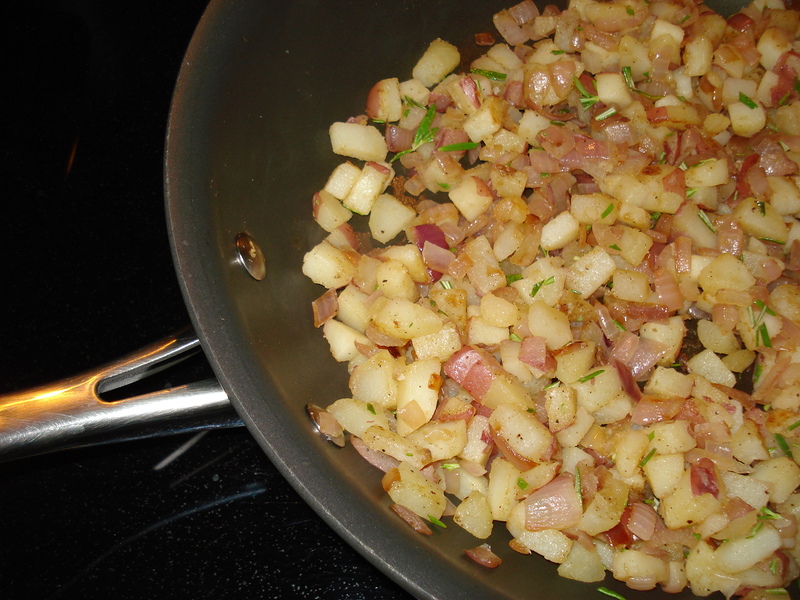 Stir in parsley or rosemary and serve immediately. Notes: This recipe is SUPER easy. Only 4 ingredients, and you can make it in like 2 minutes. A great breakfast on its own, or as an accompaniment to any brunch! Overall, it was a super satisfying, really healthy brunch – definitely felt like we were in a restaurant. Below are the final products all combined – can’t wait to make it again! The great thing about this is – the entire cooking time is about 5 min, but you end up with a delicious and super healthy smoothie which is a great option for breakfast or snacks!